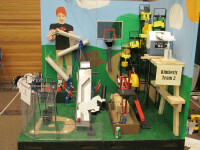 Course: Mechanical Design - aka "Rube Goldberg"
What's Next? Rube Goldberg 2012 of course! More pictures and videos to come! !